EXCLUSIVE TO TAUNTON & WELLINGTON BRANCH! If you have been following Wilfred's Blog on our Facebook page - www.facebook.com/cpTauntonandWellington - you will may like to consider buying some 'Wilfred's First Christmas' cards to share with your friends. 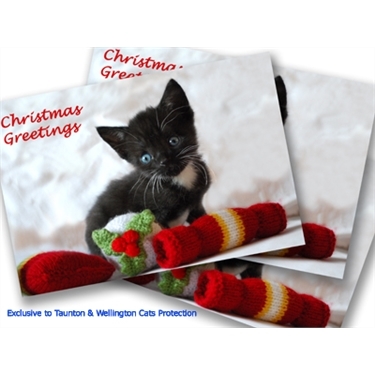 The card size is approximately 6' x 4' (15cm x 10cm) and is exclusive to Taunton and Wellington branch of Cats Protection. Inside, printed in red, are the words "Merry Christmas." All profits from sales will be donated to the branch and will go to help more cats and kittens in need of help, as Wilfred was. The cards will cost £5 for four cards and envelopes, including UK postage, and will be ready for posting shortly. If you would like to order some cards, please DO NOT leave a Facebook message as it may not be picked up. Instead, please email the humans at tandwcats@gmail.com and let them know 1) how many packs you would like, 2) your name, 3) address and 4) telephone number. They will then contact you.